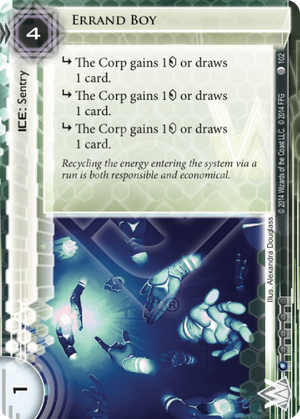 subroutine The Corp gains 1credit or draws 1 card. Recycling the energy entering the system via a run is both responsible and economical. I think the key thing to notice here is that card draw is strong in the right circumstances. Certainly 1 card > 1 Credit most of the time. The credit option ensures that you're never forced to over-draw. In any case, I think this will be best in decks that can leverage draw. I can see it as an outermost piece of Ice in Cerebral Imaging, for instance. Apart from that, it's in faction with re-use and could potentially be helpful in any deck that finds itself playing down to a small handsize. It also has mild synergy with Jackson, which is never a bad thing. The comparison with Caduceus is important, because it nullifies what would be the other argument for this Ice, which is that it's cheap and taxing. Caduceus is probably better unless a) You really like the draw or b) Link becomes prevalent in your meta. That said, it costs an extra credit to break with Mimic, which isn't nothing. Over all, I probably agree that this is second tier Ice, but I'd love to be wrong. costs 3 to break with most killers, includidng mimic femme and garotte is pretty good, but it does not do anything devastating, or force end the run, so a breaker is not needed. It's pretty weak to fast parasites, but if you encounter the subroutines before getting it murdered, it hasn't costed the corp that much. I think its nearest comparison in faction is Caduceus, but if ignoring influence this has to battle cards like Architect and Data raven, both of which has more strength and (in my opinion) better subroutines. Caduceus and Architect tax less with mimic, but Architect can be less fun to face smack, and Caduceus can end the run and is cheaper. So all in all, not bad, but I'm not sure its good enough for competitive play. The option to draw when the subs fire is really neat though, and it is cheaper to splash than any of the mentioned sentries!